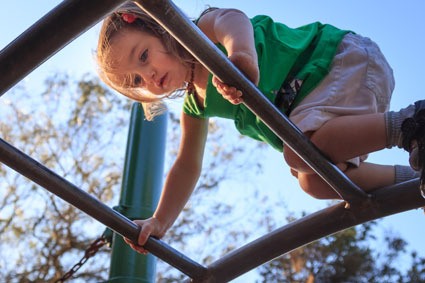 As I watch my two year old race to the play structure and try to climb a tricky bridge, something she’s never done before, my five year old warns me. “Lili can’t do that. Mama! Quick!” I wonder, should I cover her? Do I give her the space to try challenge herself? Will she be OK? Parenting can often seem like a battle among philosophies. Do you cloth diaper? Compost diaper? Potty train early? Potty train late? Purees vs. baby led weaning? I’ve come to the conclusion that every philosophy has value to add, and that the best philosophy is no philosophy, but a middle ground taking the best from everyone. I love the idea of my kids growing their responsibilities, learning how to be themselves without my constant intervention. On the other hand, I worry about the repercussions. Could my child be hurt with that knife? Will he spill an entire gallon of milk trying to refill his cup? Worse fears emerge of broken bones, kidnapping, terrible things. Unlike some of our infant choices, these later choices can have serious consequences. On the other hand, I watch a preschool parent do the puzzle for her child, who struggles for maybe a second before the mother shows him the correct angle. Will he learn for himself if not left to experiment. I watch a parent on the playground hold her 2 year old as she slides on the baby slide, one that most 1 year olds can handle on their own. And I ask myself, does this child have room to grow? Hence, the title of this blog article, how to find the middle ground. How do we give our children the space to learn without accepting undue risk? Consider what’s the worst case if you allow your child to try something alone. If it’s just a scratch or bruise, then many of us think that’s ok. You can’t stop a child from ever scraping her knee. But if the worst case is hospitalization, well, most of us would say, no. Are there alternatives that are less risky? For instance, your child wants to use a knife to help you in the kitchen or to cut his own food. Could you start with a plastic butter knife, or buy a plastic chopping knife? Or try a butter knife. Similarly, your child wants to try a challenging play structure on his own. Ask him to use the easier play structure first, and if that goes well, he can go on the larger one by himself. He wants to pour his own milk, and you don’t want a gallon of milk all over the floor. Could you keep the milk in a smaller pitcher or container that’s easier to pour from? Pause before intervening, assuming it’s not life or limb threatening, observing first. Give yourself that moment to breathe and decide whether you need to intervene. Sometimes, among siblings or friends, children will work out their disputes on their own. Ask the children for input. Many preschools work on conflict resolution by asking the children how they would resolve the problem. If the child says, “I don’t know,” give one idea and then ask them for one. Sometimes, your idea will be serious, but other times, try a silly idea. The books How to Talk So Kids Will Listen and Siblings Without Rivalry are great resources. Children learn by doing, more than watching. When a child is figuring out a puzzle or game, it might take a few tries, but the brain will remember *how* to solve the puzzle better if she figured it out herself than if you showed her how. Use tools to help the children. If your child is late, get him a watch. He wants to learn his letters, try an app. She won’t stay in bed, offer a clock that glows with colors for times that you set.